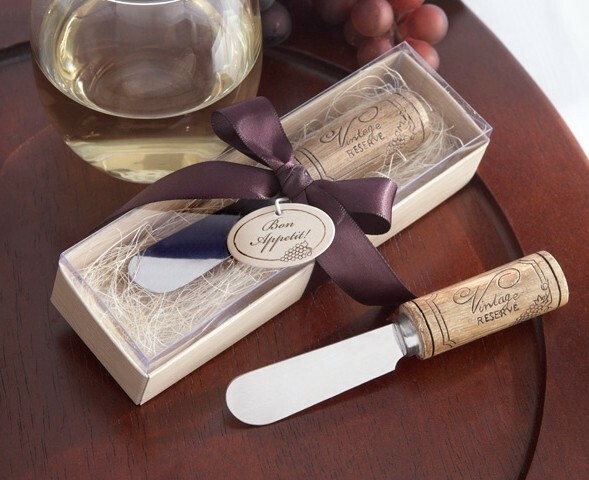 This handsome spreader features a stainless-steel blade complete with a wine-cork-shaped plastic handle, and it is certain to be a valued gift. Gift presentation includes the pictured gift-box with a beige, wood-grain pattern, clear display cover, a bed of natural raffia, a rich purple ribbon and bow, and a tag with a wine-grape motif and the words "Bon Appetit!" Personalized tags for your favors are available separately as Product Code: AK-31001NA-03-W.